It is the middle of the 16th Century in Feudal Japan. The country, once ruled by a unified government, is now split into many warring clans. 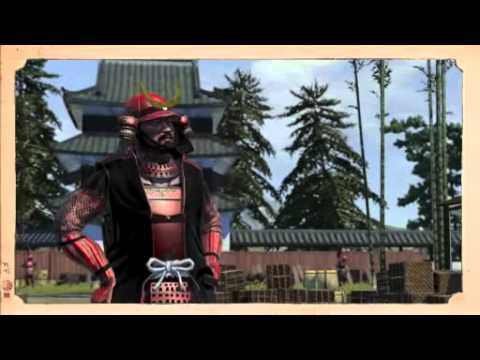 Players take on the role of one Daimyo, the clan leader, and will use military engagements, economics and diplomacy to achieve the ultimate goal, re-unite Japan under his supreme command and become the new Shogun – the undisputed ruler of a pacified nation. Shogun 2: Total War will feature enhanced full 3D battles via land and sea, which made a name for the series, as well as the tactical campaign map that many refer to as the heart and soul of Total War. Featuring a brand new AI system inspired by the scriptures that influenced Japanese warfare, the millennia old Chinese "Art of War", the Creative Assembly brings the wisdom of Master Sun Tsu to Shogun 2: Total War. Analysing this ancient text enabled the Creative Assembly to implement easy to understand yet deep strategic gameplay. 9 Playable clans ranging from the large and powerful to the tiny and weak - Take charge of any of the nine major factions of Japanese feudal history, from the mighty Oda to the more delicate but well positioned Tokugawa clan. All of these clans could rise to take the position of Shogun under your leadership. Pre-Battle speeches with Generals inspiring their men before engaging - Made famous in Rome Total War and much requested since, the generals pre-battle speeches have returned! Daimyos and Generals alike will seek to inspire their men on the battlefield (With variable results) there are over 100,000 possible speeches that could be delivered based on the character, their location, their relationship to the enemy etc. Brand new siege mechanics vastly improved over Napoleon and Empire - Japanese siege warfare is markedly different form its European equivalent. Castles are now elaborate death traps, with the enemy being invited in to attempt to destroy the defender. Defenders and attackers now have multiple options, paths and objectives within a siege and a larger number of castle types make this all the more elaborate and strategic. Much improved terrain and environments, mountains in battle and new environments - Shogun 2s terrain system is brand new to deal with the Japanese landscape and the radically different topography it presents the player. From savage mountain ranges to gentle landscapes and cherry blossom trees, the new battlefield terrain system generates battlefields that play utterly differently to previous TW titles and feel totally unique. The four seasons on the battlefield. Autumn leaves to summer sun - The four seasons are fully represented on the battlefield for the first time. Beyond simple snow and rain, the season system now affects the battlefield conditions as a whole and has an impact on the troops within it. This adds the staggering beauty of Japanese landscapes, and the tactical depth of seasonal warfare. Total War Encyclopaedia, an archive of all the units and history in the game accessible from the menu - A full knowledge base of the in game units and technologies, along with historical facts and information relevant to the players experience. Five stage castle sieges, breaking the outer walls of the toughest castle is only the start - Multiple types of castles, across a variety of terrain that can be upgraded across five different levels of fortification allow for truly diverse siege mechanics and siege play. Storming the outer walls and entering a courtyard is simply the beginning of what is a true challenge of both the defender and the attacker’s skill. Morale boosting buildings, capturing temples on the battlefield offers reward - For the first time, battlefields will feature structures that will influence the men as they fight. Protect or capture shrines or temples, or indeed burn those of your enemy, to dictate the morale of troops on the battlefield. All new historical land battles, drawn from the period - Famous battles such as Sekigahara will be included for the player to test their mettle against history’s greatest tactical challenges and feudal Japans greatest adversaries. Coastal battles; fight naval engagements of the coast of Japan navigating islands and land - For the first time ever Shogun 2 Total War combines land and sea battles. Navigate the island coast of Japan, using the coast, mist and the elements against your enemy. Use ships to create choke points and to engage as the land dictates. Unique ‘Hero’ units. Single men on the battlefield able to carve through the enemy - At the height of martial prowess and technology are the hero units. Available to the player as ‘legendary’ units of a certain discipline these troops make a distinct difference on the battlefield. A single hero surrounded by a handful of their disciples can take on large numbers of enemy troops and will seek to find enemy heroes and duel them to the death for the honour of their lord and their clan.